Preventing diabetic foot disease begins with proper foot care. NEW ORLEANS — Many clinicians are still failing to perform foot exams at all clinical visits with their patients who have diabetes, and their feet are telling the story, according to Robert Thompson, CPed, BOC Pedorthist. Unfortunately, this overlooking of foot health is resulting in amputations and other complications in adults at younger and younger ages, Thompson, who is Executive Director of the Institute for Preventive Foot Health (IPFH) in Statesville, North Carolina, said during his presentation at AADE 2015, the annual meeting of the American Association of Diabetes Educators. 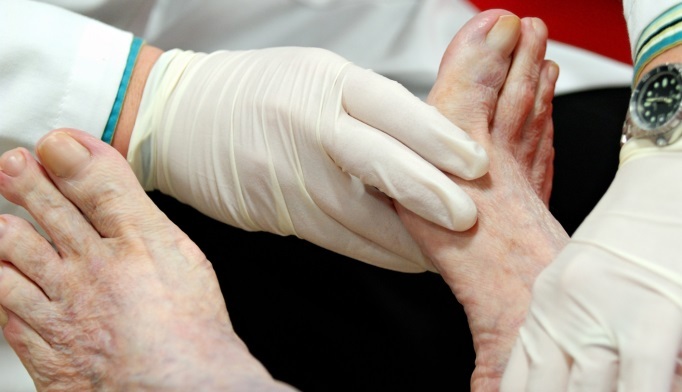 “Do not neglect to examine the feet of your diabetic patients at every visit. Our 2012 IPFH National Foot Health Assessment Survey revealed that only 46.2% of all diabetic patients have regular foot screenings. But, as persons with diabetes, their feet are always 100% at risk. Our more recent 2015 Google survey results suggest a worsening trend, with only 42.3% of diabetic persons declaring that they ‘always’ receive a foot exam when visiting their physicians,” said Thompson. The latest survey showed that 27% declared that they receive foot exams “sometimes,” 11% declared “rarely” and 19% stated “never.” What’s even more alarming was the fact that the segmented group of 18- to 24-year-old males with diabetes reported the worst numbers. In the survey, 37% responded that they “rarely” or “never” receive foot exams. The evidence to date also paints a grim picture of what can happen in the absence of proper foot care. In 2010, about 73,000 of non-traumatic lower limb amputations — representing about 60% of all non-traumatic lower limb amputations — were performed in adults aged 20 years or older with diagnosed diabetes. And another study showed that 9% to 20% of people with diabetes who experience a lower limb amputation will undergo a second amputation within 12 months of their first surgery, Thompson noted. Additionally, 5 years after the first surgery, 28% to 51% of patients with diabetes who have undergone amputation will undergo a second amputation. Also, it is now estimated that up to 55% of patients who experience a lower extremity amputation will require amputation of a second extremity within 2 to 3 years, Thompson said. “Identifying problems with the feet early and providing care for them once problems have been identified can significantly improve these statistics. It is important to note that beyond statistical outcomes improvement, patient quality of life at home, at work and at play will be the result. However, it all begins with simply asking patients to remove their shoes and socks and then carefully looking at, touching and sometimes maybe even smelling those at-risk feet,” said Thompson. Thompson said complications may result in patients with diabetes if the heels are valgus or varus, if the forefoot pronates or supinates, if the subtalar neutral strike of the heel to the ground is “off,” and if fat pads have degraded to such an extent that the metatarsal bone heads are no longer adequately protected. These mechanical and biological characteristics may be in and of themselves problems for all adults, but the complications they may present in patients with diabetes can make them more dramatic, he added. Thompson also noted that a simple lesion left untreated can lead to ulceration, infection and amputation in a very short time span. However, one major problem is the fact that the feet of patients with diabetes are so often insensate that they may be unaware of the trauma they are experiencing until it’s too late. “Foot temperature and pedal pulses might indicate not only circulatory/vascular compromises but could even be signaling the commencement of a Charcot transition. Neuropathy, of course, telegraphs the central nervous system changes the diabetic patient is undergoing. Toenail fungus and maceration between the toes can produce problems too,” said Thompson. He said identifying all the components of each patient’s unique issues is essential for the proper selection and fitting of padded socks and shoes. Further, all patients with diabetes should be counseled about the importance of preventive foot health practices so they can take the proper steps to prevent foot pain and dysfunction farther down the road. Robbins JM et al. J Am Podiatr Med Assoc. 2008;98(6):489-493. Thompson R. W04 – Foot Exams DO Tell A Tale: Do YOU Know The Story?!? Presented at: AADE 2015; Aug. 5-8, 2015; New Orleans.